More photos from the archival photo collection of CILAMS. These photos, which record the arrival of the Royal Family, for the opening of the International Airport in 1974, were taken by Bill Johnson, a former resident. 2. 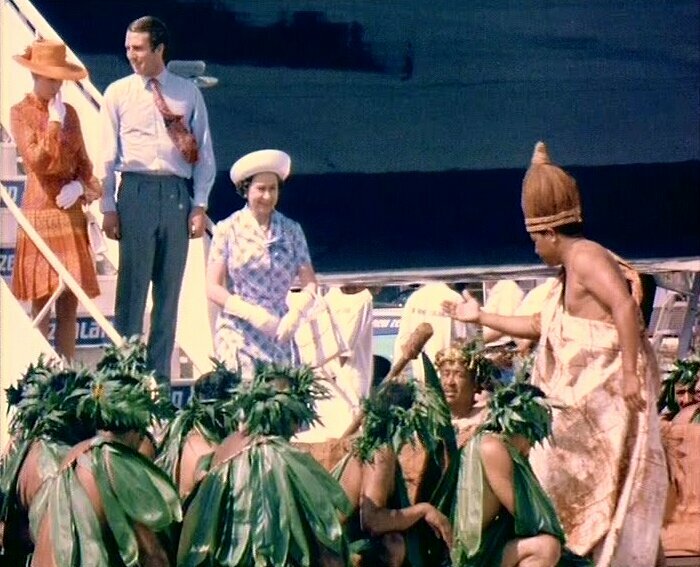 The Royals arrive in Rarotonga. 3. 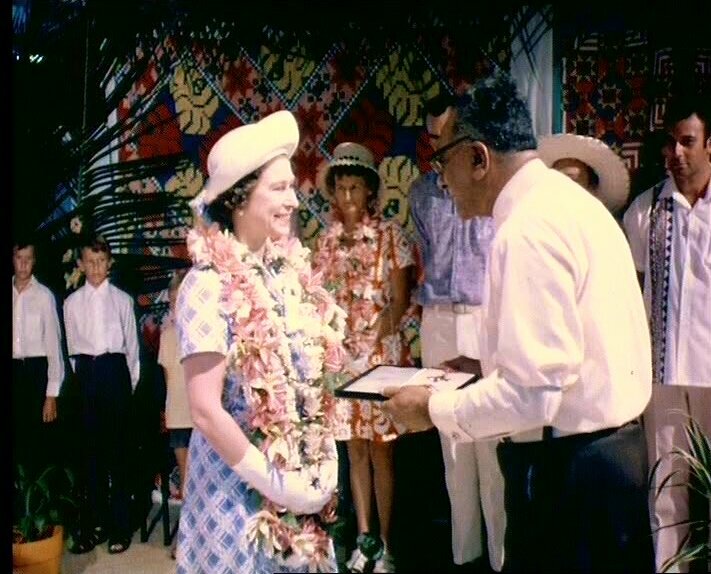 The Queen congratulates Sir Albert Henry, Premier of the Cook Islands (1965-78), after bestowing his knighthood. Bill was a Professional Photographer with Johnsons’ Photographic Studio. 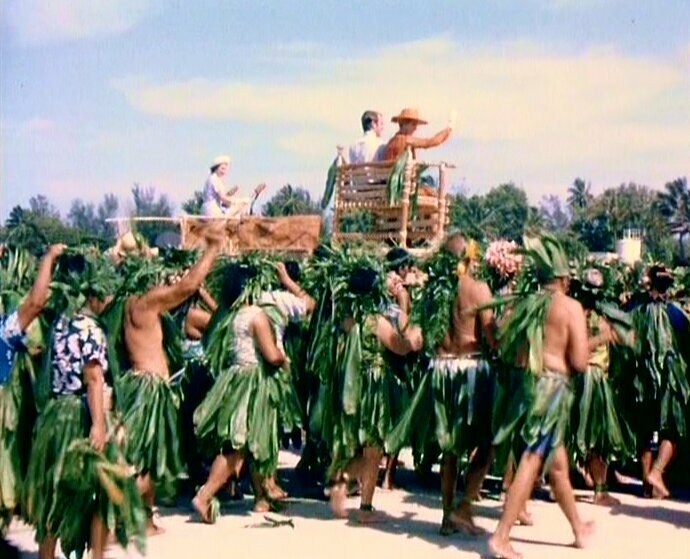 1961 returned to Rarotonga from California. Owner of Johnson’s Duty-Free until 1982. Original Director Shareholder South Seas International & Rarotonga Camera Sales early 70’s. Official Cook Islands Government Photographer for H.R.H. Prince Philip, Duke of Edinburgh; Lord Louis Mountbatten, 1st Earl Mountbatten of Burma; Lord & Lady Brabourne; Her Majesty Queen Elizabeth II; Princess Anne and Captain Mark Phillips; only Official Photographer for the Knighthood of Sir Albert Henry KBE; 1976 piped on board Her Majesty’s Yacht Britannia meet Captain Rear-Admiral Hugh Janion on the bridge before the Britannia pulled her anchor of the reef consequently, he was treated to a cruise on the Royal Yacht – few people would have experienced. Photographed Prime Ministers, Cabinet Ministers of the South Pacific region and many VIP’s. ** If you would like to use any of Bill’s photographs it would be appreciated if you asked first. Permission was granted by the Cook Islands government who commissioned and own the photos.